L.A. Southwest’s puppies are bred at the San Rafael, CA campus of Guide Dogs for the Blind. The breeding and training program uses Labrador Retrievers, Golden Retrievers, and Labrador/Golden Crosses. Raisers receive the puppies when they are between 8 and 12 weeks old. Puppies are raised and treated as members of the family until they are 14 to 18 months old. During this time, Raisers train the puppies in basic commands, teach them good house manners, introduce them to a variety of social situations, and give them lots of love! 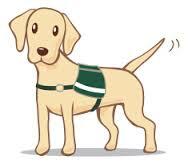 When a puppy is about 14 to 18 months old, it is ready to go back to Guide Dogs for the Blind for advanced training, primarily focused on the all important harness work. During this training the puppy will learn all the skills necessary to safely lead its visually impaired partner. Intact puppies enter into a separate evaluation by the Breeding Department for a possible career as a Breeder. After leaving its Raiser home, the pups spend two to four months in advanced training when they learn about the harness as well as other skills needed to become a Guide Dog. Once fully trained, the Guide Dog is carefully matched with a blind or visually impaired partner. The newly paired team will spend two weeks on campus learning how to work as a coordinated team. GDB is internationally recognized as a leader in providing outstanding guide dog team training and graduate follow-up and support. GDB receives absolutely NO government funds of any kind. There is NO COST to the graduate for the dog and its equipment, travel to and from campus for training, and the 2 week dormitory stay. GDB graduate services are provided free of charge. The continuation of GDB’s services depends entirely upon the generosity of the public through donations. We salute our working guides and their partners, our Breeders and Breeder Custodians, and our puppy Raisers and their puppies. Not every puppy is destined to become a guide dog. Those puppies that do not qualify for a career as a guide dog are “career changed.” GDB has a number of cooperative arrangements with other service dog organizations where some pups will find a new career. With the skills they have acquired, some dogs may become therapy dogs, work in search and rescue, or begin many other wonderful, valuable careers. Some pups will return to the raiser to become a beloved family member. Some career change dogs are adopted by carefully selected individual families to become loving pets. Regardless of its eventual role, each puppy we raise is exceptionally special. We would like you to meet the incredible dogs that have left our nests, but never our hearts. We salute our career change dogs and wish them much happiness in their new careers. Years ago, L.A. Southwest handler/dog teams were selected to kick off the GDB Pet Ambassador Dog Program. Upon recommendation by Leader Pat and after filling out an application, the applicants took the required GDB Handler Knowledge Test which was administered and scored by GDB. The handlers and their dogs passed the exam and were presented with their Pet Ambassador Dog purple scarves. L.A. Southwest career change dogs and retired guides represent GDB proudly in their communities at presentations and events. Suitability for participation in the program is regularly reviewed.